The 1967 Outer Space Treaty was one of the few things the U.S. and the Soviet Union managed to agree on at the height of the Cold War. Among other things, it forbid both nations from bringing space microbes back to Earth, or spreading Earth germs to other planets. Parties to the Treaty shall pursue studies of outer space, including the Moon and other celestial bodies, and conduct exploration of them so as to avoid their harmful contamination and also adverse changes in the environment of the Earth resulting from the introduction of extraterrestrial matter and, where necessary, shall adopt appropriate measures for this purpose. Interplanetary contamination is still of great concern to scientists today. Mostly, they worry about single-celled, microscopic organisms, such as bacteria, some fungi, and viruses - or whatever the alien version of single-celled life looks like. We know for certain that bacteria and viruses can survive exposure to the harsh conditions of space long enough to hitch a ride to someplace more hospitable. Here on Earth, many microorganisms thrive in extreme heat, extreme cold, environments with little oxygen, or environments with high doses of radiation. In fact, biologists have studied these so-called “extremophiles” to learn how life might thrive on other worlds, like Mars, Jupiter’s moon Europa, or Saturn’s moons Enceladus and Titan. Luckily, scientists working with space programs have thought a lot about how to prevent an interplanetary plague or contamination event. If we find life on another world (assuming it’s not sentient and well-armed), we’re going to want to bring samples back to Earth. And we’re going to want to bring them back alive. So we’ve got to have a way of preventing back contamination, or the act of bringing extraterrestrial micro-organisms back to Earth, or into human colonies in space. Our typical ways of preventing contamination aren’t going to work — we can’t leave the life behind, and we can’t sterilize everything. So we’d opt for heavy-duty containment. During the missions, the Apollo crews were careful not to track materials from the lunar surface into the Command Module which would return to Earth. 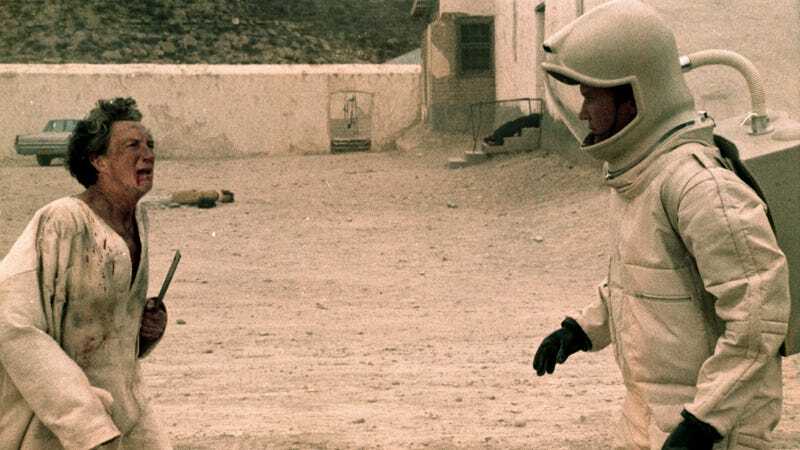 That sounds like “wash your hands and wipe your feet,” but it’s more complicated when you’re wearing a bulky spacesuit in an environment that’s full of dust. Once they returned to Earth, the crews went into immediate quarantine. First they lived in a mobile isolation unit on the aircraft carrier that recovered the landing capsule, then in an aircraft set up for isolation, and finally in a special quarantine unit at the Johnson Space Center in Houston, Texas. They stayed there for three weeks, while NASA doctors performed tests and watched for any signs of illness that might indicate an alien infection. Apollo 11 crew in quarantine. Image credit: NASA. Meanwhile, the lunar samples went to the Lunar Receiving Lab at Johnson Space Center, where they could be studied in careful quarantine. Once the samples were proven to be devoid of life, some were released to other research facilities. NASA’s plan for bringing Martian samples home is a bit more advanced. The agency’s Planetary Protection Subcommittee recently laid out its proposal for preventing back contamination. It includes a requirement that any samples brought back to Earth must be either sterilized or packed in a sealed container before being brought aboard the spacecraft. That containment system must also have a redundant failsafe as a backup. They’re not playing around. The proposal also says, “The mission and the spacecraft design must provide a method to ‘break the chain of contact’ with Mars. No uncontained hardware that contacted Mars, directly or indirectly, shall be returned to Earth.” Sorry, Curiosity Rover: you can never come home. Once on Earth, the samples would, according to NASA’s proposal, go straight to a Sample Return Facility, where they would be subjected to a battery of tests for potential biohazards. Once they’re deemed clean, they will be distributed to other research facilities. NASA’s proposed Sample Return Facility would include Biosafety Level 4 labs (the same types of facilities where viruses like Ebola are studied today), as well as cleanrooms to prevent the Martian samples from picking up any stray Earth germs. Unfortunately, “such an integrated facility is not currently available,” NASA notes. So, what happens in the unlikely event that those measures fail, and the first crewed mission to Mars sets alien microbes loose on Earth? We don’t know, and that’s what makes containment so important. The whole thing could play out like a microscopic version of H.G. Wells’ War of the Worlds, where terrifying Martian invaders are killed off by Earth viruses. If extraterrestrial microbes escape from containment, they might not last long out in the world, where they have to compete with Earth’s own battalions of bacteria and viruses. Of course we might see the opposite scenario. Extraterrestrial microbes might thrive in Earth’s environment, and they might out-compete many Earth microbes, just like today’s terrestrial invasive species — which are problematic enough without help from other worlds. Humans would have no natural immunity to Martian pathogens, and our whole species might be wiped out. So you might think of extraterrestrial microbes as the potential next version of Ebola, which explains the Biohazard Level 4 recommendation. But humans aren’t the only ones in danger. Extraterrestrial microbes could rapidly wipe out Earth’s other animal species, plants, and microbes. That might actually be a more horrific scenario: humanity survives, but all the animals and plants we depend on for sustenance die off, or all the microbes that play such a vital role in our environment are displaced by alien microbes that don’t fill the same roles. There’s probably an excellent post-apocalyptic novel waiting to be built around that scenario. But what about the danger of bringing our own viruses into space? Preventing forward contamination, or polluting alien worlds with our Earth microbes, is simpler than preventing back contamination. Scientists and engineers don’t have to worry about preserving Earth microbes for later study, so they can just sterilize the daylights out of every component that’s going up. Before liftoff, several components of the Mars rovers had to be heated to 110 degrees Celsius, a little hotter than the boiling point of water, while others were doused with alcohol. Engineers and technicians working on the Mars rovers often work in a clean room, to avoid contaminating sterile spacecraft components. And they still wiped parts down with alcohol periodically, just to make sure. Even with all those precautions, it’s impossible to achieve perfect sterility. Just as there are regulations about how many bug parts can be in your cereal, there is also an acceptable amount of microbial contamination for the Mars rovers: no more than 300,000 bacterial spores on any single surface that will be exposed to the Martian environment. NASA scientists call this an acceptable “bioburden,” and it’s based on the assumption that if there only a few spores present, they ultimately won’t be able survive and reproduce in the Martian environment. But recent experiments say there might be a chance that resilient, spore-forming bacteria could burrow into Martian rocks and soil and live there. We don’t know yet whether this has actually happened, but researchers are working on ways for future missions to find out, and avoid further contamination of potential local microbes. And as always, humans complicate things, so eventual human missions to other worlds will face some serious challenges in terms of protecting the local environment. It’s simply impossible to sterilize human space travelers, and yet keeping human travelers and their germs isolated from the environments of whatever planets we visit will be crucial to preventing forward contamination. Future Mars colonists who want to wander around outside may have to suit up, then pass through an airlock to a decontamination room, and then cycle through another airlock to get outside. It would probably work similarly to entering a clean room or a Biosafety Level 4 facility here on Earth. On Mars, it could add a layer of complexity (and expense) to future colonization efforts. If we’re looking for life on other worlds, we don’t want mess up that research by planting microbes in the places we’re trying to search. That could lead to a false positive, where scientists would see signs of life - whether actual microbes, or just the chemical signatures of their metabolism - and declare that alien life had been found. In the long run, it could damage the whole field of astrobiology in the eyes of the public, funding agencies, and other scientists. Plus, the chemical signatures of Earth microbes might make it harder to recognize the signs of native microbial life. And there’s always the possibility that our germs could become a frighteningly successful invasive species on another world, wiping out alien life before we’ve even had a chance to become acquainted.